In late May 2011, I traveled to my favorite town of Moab, Utah. As usual, I planned to stay at the Moab Rim RV Campark & Cabins. For many years, the Campark owners, Sue and Jim Farrell have been my hosts each spring and fall. Earlier, when I had called to make a reservation, Sue asked if I would like my usual spot, down at the south end, away from most of the activity. Of course, I said, “Yes”, having lived in that spot for three months during 2006. The nearly unimpeded view of the La Sal Range from my front door makes that spot special to me. In Moab, it had been a cold, snowy winter and a tumultuous spring. After some good weather in early spring, one after another, storms rolled through Southeast Utah. Rather than a typical spring thaw in the Sierra La Sal, the snowpack held and even grew in May. Upon arrival, all I could see on the mountains was a sea of snow clouds, dumping their moisture on the upper peaks. From across the Spanish Valley, the La Sal Range is one of those rare snowfields where you can actually see the snow falling through the sky. By my second afternoon in Moab, the rain showers at the RV Park ended and the clouds began clearing from the mountains. As the sun made a brief afternoon appearance, it bathed the whole area in golden light. The unexpected sunshine brought campers out from their coaches and tents. On a clear spring afternoon, the Moab sun brings new depth of color to both the mountains and the sky. While I was out looking around, I came upon a two-year-old boy and his father. 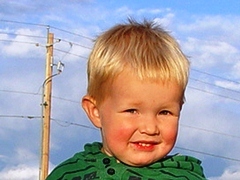 They and the boy’s mother were first-time RVers, traveling through the High Southwest. The father expressed disappointment that all of the Colorado Riverway campgrounds were full. Since it was still days away from the Memorial Day weekend, I assume that he did not drive down Kane Creek Road to the BLM campgrounds there. To him, a night with electrical, water and a sewer hook-up meant one fewer day spent in a self-contained wilderness experience. The young boy answered to Mikael, or a name close to that. By his playful, two-year-old looks and actions, I supposed he might be the next Archangel Mikael, stopping in Moab to enjoy a three-dimensional, time-space reality. As I spoke with his father, young Mikael romped around in the gravel and even threw his first stone. Up it went, landing gently on his father’s head, where it slowly slid away. Shocked to see Mikael throw the rock and equally shocked by its landed on his head, the father admonished his son, “Not to throw rocks”. Young Mikael listened for a moment and then ran off to play. At the Moab Rim Campark, a cloudless sunset is always a treat. That means that the last rays of the setting sun will find their way to a part of the Moab Rim that I call the Moab Acropolis. My Moab Acropolis consists of two oversized blocks of eroded sandstone sitting at the highest point of the Moab Rim. Both the Moab Acropolis and its namesake, the Acropolis of Athens, rest upon rocky perches. As the sun set that late spring day, it illuminated that crest from Behind the Rocks, lighting up the sides of my twin imaginary buildings. In my coach that evening, I uploaded that day’s images from my camera to my laptop computer. Next, I burned a CD of pictures for the father and son. Since it was late, I did not disturb them that evening. The next morning, when I awoke, young Archangel Mikael and his parents were gone. I assume that they headed away from civilization and towards the High Southwest campground of their dreams. Perhaps someday, father or son will Google the term “Moab Rim Campark” and find this article. If they contact me, I still have that CD of Moab memories ready to mail. As many people know, Moab is “Jeep Country, USA”. From the annual Easter Jeep Safari to the many Jeep trails within Grand County, a Jeep is the vehicle of choice for locals and visitors alike. If you own a Toyota or a Land Cruiser, they will still greet you and treat you nicely, but secretly they will be wondering why you did not buy a Jeep. In one of my walks around the RV Park, the only vehicles I saw parked there were Jeeps. Then, to disprove my point, along came a converted military Humvee. The next morning, Jim Farrell and I got into his Jeep Wrangler Limited and headed south on U.S. Highway 191. “The color of this Jeep is Mango-Tango”, Jim told me. About ten miles south of the RV Park, we turned left from the highway and onto an unmarked dirt road. About a mile from the highway, we stopped at the Desert Rocks Festival 2011 check-in location at Area BFE. Later that day we would visit Desert Rocks, but now we were on our way to a new house under construction. With unobstructed views of the La Sal Range and Behind the Rocks, Jim told me that this was his final home design project. I was impressed with his talents. Upon our return to the RV Park, I installed our fourth webcam at the property. 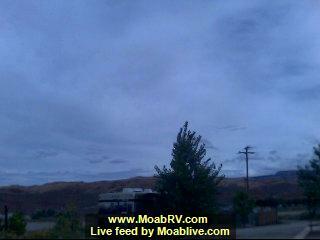 We feature the three original webcams on the MoabLive.com Webcam Page and on the Campark website at MoabRV.com. The new webcam, I call “Check-in Cam”, as it points directly out the front window of the office. When guests pull in, you will see them and their rig, front and center. With new ownership, this mage no longer refreshes. If anyone wants to say, “Hi” to the folks back home, go the RV Park, stand in front of the window and call your friends on your mobile telephone. Then you can mug for the camera. Do not forget that there are 300,000,000 Chinese smart phones online, so you will be mugging for many of them, as well. Bring signs… Have fun. It is free entertainment, courtesy of MoabLive.com and the Moab Rim RV Campark. Be sure to tell the folks in the office that Moab Jim sent you.